^ 井田茂 2003, p. 12. ^ Sharp, A. G.; Moses, J. I.; Friedson, A. J.; Fegley, B.; Marley, M. S.; Lodders, K. (2004). “Predicting the Atmospheric Composition of Extrasolar Giant Planets”. 35th Lunar and Planetary Science Conference (Lunar and Planetary Science Conference) 35: 1152. Bibcode: 2004LPI....35.1152S. http://www.lpi.usra.edu/meetings/lpsc2004/pdf/1152.pdf. ^ a b c 井田茂 2016, p. 8-9. ^ 井田茂 2016, p. 24-25. ^ a b c d e f Winn, Joshua N.; Fabrycky, Daniel; Albrecht, Simon; Johnson, John Asher (2010-01-01). “Hot Stars with Hot Jupiters Have High Obliquities” (英語). The Astrophysical Journal Letters 718 (2): L145. arXiv:1006.4161. Bibcode: 2010ApJ...718L.145W. doi:10.1088/2041-8205/718/2/L145. ISSN 2041-8205. http://stacks.iop.org/2041-8205/718/i=2/a=L145. ^ Chauvin, G. et al. (2005). “A companion to AB Pic at the planet/brown dwarf boundary”. Astronomy and Astrophysics 438 (3): L29-L32. arXiv:astro-ph/0504658. doi:10.1051/0004-6361:200500111. ISSN 0004-6361. ^ a b Fabrycky, D.; Tremaine, S. (2007-11-10). “Shrinking Binary and Planetary Orbits by Kozai Cycles with Tidal Friction”. Astrophysical Journal 669 (2): 1298–1315. arXiv:0705.4285. Bibcode: 2007ApJ...669.1298F. doi:10.1086/521702. ^ a b c Mandushev, Georgi et al. (2007). “TrES-4: A Transiting Hot Jupiter of Very Low Density”. The Astrophysical Journal 667 (2): L195-L198. arXiv:0708.0834v1. Bibcode: 2007ApJ...667L.195M. doi:10.1086/522115. ISSN 0004-637X. ^ Zhou, G.; Bakos, G. Á.; Hartman, J. D.; Latham, D. W.; Torres, G.; Bhatti, W.; Penev, K.; Buchhave, L. et al. (2017). “HAT-P-67b: An Extremely Low Density Saturn Transiting an F-subgiant Confirmed via Doppler Tomography”. The Astronomical Journal 153 (5): 211. arXiv:1702.00106. Bibcode: 2017AJ....153..211Z. doi:10.3847/1538-3881/aa674a. ISSN 1538-3881. ^ a b c d Baraffe, I; Chabrier, G; Barman, T (2010). “The physical properties of extra-solar planets”. Reports on Progress in Physics 73 (1): 016901. arXiv:1001.3577. Bibcode: 2010RPPh...73a6901B. doi:10.1088/0034-4885/73/1/016901. ISSN 0034-4885. ^ a b c d Burrows, A.; Hubeny, I.; Budaj, J.; Hubbard, W. B. (2007). “Possible Solutions to the Radius Anomalies of Transiting Giant Planets”. The Astrophysical Journal 661 (1): 502–514. arXiv:astro-ph/0612703. Bibcode: 2007ApJ...661..502B. doi:10.1086/514326. ISSN 0004-637X. ^ Cooper, Curtis S.; Showman, Adam P. (2005-01-01). “Dynamic Meteorology at the Photosphere of HD 209458b” (英語). The Astrophysical Journal Letters 629 (1): L45. arXiv:astro-ph/0502476. Bibcode: 2005ApJ...629L..45C. doi:10.1086/444354. ISSN 1538-4357. http://stacks.iop.org/1538-4357/629/i=1/a=L45. ^ a b Rauscher, Emily; Menou, Kristen (2010-01-01). “Three-dimensional Modeling of Hot Jupiter Atmospheric Flows” (英語). The Astrophysical Journal 714 (2): 1334–1342. arXiv:0907.2692. Bibcode: 2010ApJ...714.1334R. doi:10.1088/0004-637X/714/2/1334. ISSN 0004-637X. http://stacks.iop.org/0004-637X/714/i=2/a=1334. ^ Johnson, John Asher et al. (2012). “Characterizing the Cool KOIs II. The M Dwarf KOI-254 and its Hot Jupiter”. The Astrophysical Journal 143 (5): 1-11. arXiv:1112.0017. Bibcode: 2012AJ....143..111J. doi:10.1088/0004-6256/143/5/111. ISSN 0004-6256. ^ Ballesteros, F.J.; Fernandez-Soto, A.; Martínez, V.J. (2019). “Diving into Exoplanets: Are Water Seas the Most Common?”. Astrobiology. doi:10.1089/ast.2017.1720. ISSN 1531-1074. ^ 井田茂 2016, p. 2425. ^ 井田茂 2016, p. 204. ^ 井田茂 2016, p. 22-23. ^ 井田茂 2016, p. 10. ^ 井田茂 2016, p. 34-35. ^ a b c Knutson, Heather A.; Charbonneau, David; Allen, Lori E.; Fortney, Jonathan J.; Agol, Eric; Cowan, Nicolas B.; Showman, Adam P.; Cooper, Curtis S. et al. (2007). “A map of the day–night contrast of the extrasolar planet HD 189733b”. Nature 447 (7141): 183–186. arXiv:0705.0993. Bibcode: 2007Natur.447..183K. doi:10.1038/nature05782. ISSN 0028-0836. ^ a b c Berdyugina, S.V. ; Berdyugin, A.V. ; Fluri, D.M. ; Piirola, V. (2011). “Polarized reflected light from the exoplanet HD189733b: First multicolor observations and confirmation of detection”. Astrophysical Journal Letters 726 (1): L6–L9. arXiv:1101.0059. Bibcode: 2011ApJ...728L...6B. doi:10.1088/2041-8205/728/1/L6. http://iopscience.iop.org/2041-8205/728/1/L6/. ^ a b c Seager 2010, p. 211-228. ^ Sudarsky, D.; Burrows, A.; Pinto, P. (2000). “Albedo and Reflection Spectra of Extrasolar Giant Planets”. The Astrophysical Journal 538 (2): 885–903. arXiv:astro-ph/9910504. Bibcode: 2000ApJ...538..885S. doi:10.1086/309160. http://www.iop.org/EJ/abstract/0004-637X/538/2/885/. ^ Nichols, J. D. (2011). “Magnetosphere–ionosphere coupling at Jupiter-like exoplanets with internal plasma sources: implications for detectability of auroral radio emissions”. Monthly Notices of the Royal Astronomical Society 414 (3): 2125. arXiv:1102.2737. Bibcode: 2011MNRAS.414.2125N. doi:10.1111/j.1365-2966.2011.18528.x. http://onlinelibrary.wiley.com/doi/10.1111/j.1365-2966.2011.18528.x/full. ^ a b Vidal-Madjar, A.; des Etangs, A. Lecavelier; Désert, J.-M.; Ballester, G. E.; Ferlet, R.; Hébrard, G.; Mayor, M. (2003). “An extended upper atmosphere around the extrasolar planet HD209458b”. Nature 422 (6928): 143–146. Bibcode: 2003Natur.422..143V. doi:10.1038/nature01448. ISSN 0028-0836. ^ I. A. G. Snellen, S. Albrecht, E. J. W. de Mooij, and R. S. Le Poole (2008). “Ground-based detection of sodium in the transmission spectrum of exoplanet HD 209458b”. Astronomy & Astrophysics 487 (1): 357–362. arXiv:0805.0789. Bibcode: 2008A&A...487..357S. doi:10.1051/0004-6361:200809762. http://www.aanda.org/index.php?option=article&access=standard&Itemid=129&url=/articles/aa/abs/2008/31/aa09762-08/aa09762-08.html. ^ Peter Van de Kamp (1963). “Astrometric study of Barnard's star from plates taken with the 24-inch Sproul refractor”. The Astronomical Journal 68 (7): 515. Bibcode: 1963AJ.....68..515V. doi:10.1086/109001. ^ van de Kamp, P. (1969). “Alternate dynamical analysis of Barnard's star”. Astronomical Journal 74: 757–759. Bibcode: 1969AJ.....74..757V. doi:10.1086/110852. ^ Gatewood, George; Eichhorn, H. (1973). “An unsuccessful search for a planetary companion of Barnard's star (BD +4 3561)”. The Astronomical Journal 78 (10): 769. Bibcode: 1973AJ.....78..769G. doi:10.1086/111480. ^ a b c 井田茂 2003. ^ a b Mayor, Michel; Queloz, Didier (1995). “A Jupiter-mass companion to a solar-type star”. Nature 378 (6555): 355–359. Bibcode: 1995Natur.378..355M. doi:10.1038/378355a0. ISSN 0028-0836. ^ D'Angelo, G.; Lissauer, J. J. (2018). “Formation of Giant Planets”. In Deeg H., Belmonte J.. Handbook of Exoplanets. Springer International Publishing AG, part of Springer Nature. pp. 2319–2343. arXiv:1806.05649. Bibcode: 2018haex.bookE.140D. doi:10.1007/978-3-319-55333-7_140. ISBN 978-3-319-55332-0. ^ Dawson, Rebekah I.; Johnsom, John Asher (2018). “Origins of Hot Jupiters”. Annual Review of Astronomy and Astrophysics 56: 175–221. arXiv:1801.06117. doi:10.1146/annurev-astro-081817-051853. ^ D'Angelo, Gennaro; Durisen, Richard H.; Lissauer, Jack J. (December 2010). “Giant Planet Formation”. In Seager, Sara. Exoplanets. University of Arizona Press. pp. 319–346. arXiv:1006.5486. Bibcode: 2010exop.book..319D. ISBN 978-0-8165-2945-2. ^ D'Angelo, G.; Lubow, S. H. (2008). “Evolution of Migrating Planets Undergoing Gas Accretion”. The Astrophysical Journal 685 (1): 560–583. arXiv:0806.1771. Bibcode: 2008ApJ...685..560D. doi:10.1086/590904. ^ Lubow, S. H.; Ida, S. (2011). “Planet Migration”. In S. Seager.. Exoplanets. University of Arizona Press, Tucson, AZ. pp. 347–371. arXiv:1004.4137. Bibcode: 2011exop.book..347L. ^ a b c 井田茂 2007, p. 154-155. ^ 井田茂 2003, p. 33. ^ Knutson, Heather A.; Fulton, Benjamin J.; Montet, Benjamin T.; Kao, Melodie; Ngo, Henry; Howard, Andrew W.; Crepp, Justin R.; Hinkley, Sasha et al. (2014-01-01). “Friends of Hot Jupiters. I. A Radial Velocity Search for Massive, Long-period Companions to Close-in Gas Giant Planets” (英語). The Astrophysical Journal 785 (2): 126. arXiv:1312.2954. Bibcode: 2014ApJ...785..126K. doi:10.1088/0004-637X/785/2/126. ISSN 0004-637X. http://stacks.iop.org/0004-637X/785/i=2/a=126. ^ 井田茂 2016, p. 204-205. ^ a b Batygin, Konstantin; Bodenheimer, Peter H.; Laughlin, Gregory P. (2016). “In Situ Formation and Dynamical Evolution of Hot Jupiter Systems”. The Astrophysical Journal 829 (2): 114. arXiv:1511.09157. Bibcode: 2016ApJ...829..114B. doi:10.3847/0004-637X/829/2/114. ^ 井田茂 2007, p. 25-39. ^ Hayashi, Chushiro (1981-01-01). “Structure of the Solar Nebula, Growth and Decay of Magnetic Fields and Effects of Magnetic and Turbulent Viscosities on the Nebula” (英語). Progress of Theoretical Physics Supplement 70: 35–53. Bibcode: 1981PThPS..70...35H. doi:10.1143/PTPS.70.35. ISSN 0375-9687. オリジナルの2015-02-19時点によるアーカイブ。. https://archive.is/20150219181115/http://ptps.oxfordjournals.org/content/70/35. ^ Rafikov, Roman R. (2006-01-01). “Atmospheres of Protoplanetary Cores: Critical Mass for Nucleated Instability” (英語). The Astrophysical Journal 648 (1): 666–682. arXiv:astro-ph/0405507. Bibcode: 2006ApJ...648..666R. doi:10.1086/505695. ISSN 0004-637X. http://stacks.iop.org/0004-637X/648/i=1/a=666. ^ D'Angelo, G.; Bodenheimer, P. (2016). “In Situ and Ex Situ Formation Models of Kepler 11 Planets”. The Astrophysical Journal 828 (1): in press. arXiv:1606.08088. Bibcode: 2016ApJ...828...33D. doi:10.3847/0004-637X/828/1/33. ^ Bonfils, X.; Lo Curto, G.; Correia, A. C. M.; Laskar, J.; Udry, S.; Delfosse, X.; Forveille, T.; Astudillo-Defru, N. et al. (2013). “The HARPS search for southern extra-solar planets”. Astronomy & Astrophysics 556: A110. arXiv:1109.2497. doi:10.1051/0004-6361/201220237. ISSN 0004-6361. ^ Batalha, Natalie M.; Rowe, Jason F.; Bryson, Stephen T.; Barclay, Thomas; Burke, Christopher J.; Caldwell, Douglas A.; Christiansen, Jessie L.; Mullally, Fergal et al. (2013-01-01). “Planetary Candidates Observed by Kepler. III. Analysis of the First 16 Months of Data” (英語). The Astrophysical Journal Supplement Series 204 (2): 24. arXiv:1202.5852. Bibcode: 2013ApJS..204...24B. doi:10.1088/0067-0049/204/2/24. ISSN 0067-0049. http://stacks.iop.org/0067-0049/204/i=2/a=24. ^ 松井孝典 2011, p. 259-267. ^ a b c Fogg, Martyn J.; Nelson, Richard P. (2007). “On the formation of terrestrial planets in hot-Jupiter systems”. Astronomy and Astrophysics 461 (3): 1195–1208. arXiv:astro-ph/0610314. Bibcode: 2007A&A...461.1195F. doi:10.1051/0004-6361:20066171. ^ Nayakshin, Sergei (20 September 2011). “Hot Super Earths: disrupted young jupiters?”. Monthly Notices of the Royal Astronomical Society 416 (4): 2974–2980. arXiv:1103.1846. Bibcode: 2011MNRAS.416.2974N. doi:10.1111/j.1365-2966.2011.19246.x. https://academic.oup.com/mnras/article/416/4/2974/976497 2017年12月25日閲覧。. ^ a b Becker, Juliette C. et al. (2015-08-10). “WASP-47: A Hot Jupiter System with Two Additional Planets Discovered by K2”. The Astrophysical Journal Letters (IOP Publishing) 812 (2): L18. arXiv:1508.02411. Bibcode: 2015ApJ...812L..18B. doi:10.1088/2041-8205/812/2/L18. "The mass of WASP-47d is 15.2±7 M⊕. Only an upper limit can be placed on WASP-47e of <22M⊕." ^ 井田茂 2016, p. 46-47. ^ Triaud, A. H. M. J.; Queloz, D.; Bouchy, F.; Moutou, C.; Collier Cameron, A.; Claret, A.; Barge, P.; Benz, W. et al. (2009-10-01). “The Rossiter-McLaughlin effect of CoRoT-3b and HD 189733b”. Astronomy and Astrophysics 506 (1): 377–384. arXiv:0907.2956. Bibcode: 2009A&A...506..377T. doi:10.1051/0004-6361/200911897. ISSN 0004-6361. https://digital.csic.es/bitstream/10261/24876/1/A.%20Ast.%20506%201%20377-.%20pdf.pdf. ^ Hebrard, G.; Desert, J.-M.; Diaz, R. F.; Boisse, I.; Bouchy, F.; Etangs, A. Lecavelier des; Moutou, C.; Ehrenreich, D. et al. (2010). 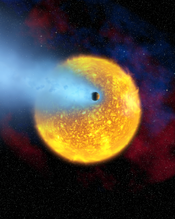 “Observation of the full 12-hour-long transit of the exoplanet HD80606b. Warm-Spitzer photometry and SOPHIE spectroscopy”. Astronomy and Astrophysics 516: A95. arXiv:1004.0790. Bibcode: 2010A&A...516A..95H. doi:10.1051/0004-6361/201014327. ISSN 0004-6361. ^ a b Malavolta, Luca (9 February 2018). “An Ultra-short Period Rocky Super-Earth with a Secondary Eclipse and a Neptune-like Companion around K2-141”. The Astronomical Journal 155 (3): 107. doi:10.3847/1538-3881/aaa5b5. ^ a b c d Sahu et al. (2006). “Transiting extrasolar planetary candidates in the Galactic bulge” (abstract). Nature 443 (7111): 534–540. arXiv:astro-ph/0610098. Bibcode: 2006Natur.443..534S. doi:10.1038/nature05158. PMID 17024085. http://www.nature.com/nature/journal/v443/n7111/abs/nature05158.html. ^ a b Sanchis-Ojeda, Roberto; Rappaport, Saul; Winn, Joshua N.; Kotson, Michael C.; Levine, Alan; Mellah, Ileyk El (2014). “A STUDY OF THE SHORTEST-PERIOD PLANETS FOUND WITHKEPLER”. The Astrophysical Journal 787 (1): 47. arXiv:1403.2379. Bibcode: 2014ApJ...787...47S. doi:10.1088/0004-637X/787/1/47. ISSN 0004-637X. ^ Lopez, Eric D. (2017). “Born dry in the photoevaporation desert: Kepler's ultra-short-period planets formed water-poor”. Monthly Notices of the Royal Astronomical Society 472 (1): 245–253. arXiv:1610.01170. Bibcode: 2017MNRAS.472..245L. doi:10.1093/mnras/stx1558. ISSN 0035-8711. ^ Winn, Joshua N.; Sanchis-Ojeda, Roberto; Rogers, Leslie; Petigura, Erik A.; Howard, Andrew W.; Isaacson, Howard; Marcy, Geoffrey W.; Schlaufman, Kevin C. et al. (2017). “Absence of a Metallicity Effect for Ultra-short-period Planets”. The Astronomical Journal 154 (2): 60. arXiv:1704.00203. Bibcode: 2017AJ....154...60W. doi:10.3847/1538-3881/aa7b7c. ISSN 1538-3881. ^ Valsecchi, Francesca; Rasio, Frederic A.; Steffen, Jason H. (2014). “FROM HOT JUPITERS TO SUPER-EARTHS VIA ROCHE LOBE OVERFLOW”. The Astrophysical Journal 793 (1): L3. arXiv:1408.3635. Bibcode: 2014ApJ...793L...3V. doi:10.1088/2041-8205/793/1/L3. ISSN 2041-8213. ^ a b c d e f 井田茂 2016, p. 250-251. ^ a b c Batygin, Konstantin; Stevenson, David J. (2010). “INFLATING HOT JUPITERS WITH OHMIC DISSIPATION”. The Astrophysical Journal 714 (2): L238–L243. arXiv:1002.3650. Bibcode: 2010ApJ...714L.238B. doi:10.1088/2041-8205/714/2/L238. ISSN 2041-8205. ^ a b c Batygin, Konstantin; Stevenson, David J.; Bodenheimer, Peter H.; Huang, Xu (2011). “Evolution of Ohmically Heated Hot Jupiters”. The Astrophysical Journal 738: 1. arXiv:1101.3800v4. Bibcode: 2011ApJ...738....1B. doi:10.1088/0004-637X/738/1/1. ^ Chabrier, Gilles; Baraffe, Isabelle (2007). “Heat Transport in Giant (Exo)planets: A New Perspective”. The Astrophysical Journal 661 (1): L81–L84. arXiv:astro-ph/0703755. Bibcode: 2007ApJ...661L..81C. doi:10.1086/518473. ISSN 0004-637X. ^ Showman, A. P.; Guillot, T. (2002). “Atmospheric circulation and tides of “51 Pegasus b-like” planets”. Astronomy & Astrophysics 385 (1): 166–180. arXiv:astro-ph/0202236. Bibcode: 2002A&A...385..166S. doi:10.1051/0004-6361:20020101. ISSN 0004-6361. ^ Bodenheimer, Peter; Lin, D. N. C.; Mardling, R. A. (2001). “On the Tidal Inflation of Short‐Period Extrasolar Planets”. The Astrophysical Journal 548 (1): 466–472. Bibcode: 2001ApJ...548..466B. doi:10.1086/318667. ISSN 0004-637X. ^ Arras, Phil; Socrates, Aristotle (2010). “THERMAL TIDES IN FLUID EXTRASOLAR PLANETS”. The Astrophysical Journal 714 (1): 1–12. arXiv:0912.2313. Bibcode: 2010ApJ...714....1A. doi:10.1088/0004-637X/714/1/1. ISSN 0004-637X. ^ a b Barnes, Jason W.; O’Brien, D. P. (2002). “Stability of Satellites around Close‐in Extrasolar Giant Planets”. The Astrophysical Journal 575 (2): 1087–1093. arXiv:astro-ph/0205035. Bibcode: 2002ApJ...575.1087B. doi:10.1086/341477. ISSN 0004-637X. ^ Российские астрономы впервые открыли луну возле экзопланеты (in Russian) – "Studying of a curve of change of shine of WASP-12b has brought to the Russian astronomers unusual result: regular splashes were found out.<...> Though stains on a star surface also can cause similar changes of shine, observable splashes are very similar on duration, a profile and amplitude that testifies for benefit of exomoon existence." ^ a b Spiegel, David S.; Madhusudhan, Nikku (2012-09-01). “Jupiter will Become a Hot Jupiter: Consequences of Post-main-sequence Stellar Evolution on Gas Giant Planets”. The Astrophysical Journal 756 (2): 132. arXiv:1207.2770. Bibcode: 2012ApJ...756..132S. doi:10.1088/0004-637X/756/2/132. ISSN 0004-637X. ^ Grunblatt, Samuel K.; Huber, Daniel (2017-12-01). “Seeing Double with K2: Testing Re-inflation with Two Remarkably Similar Planets around Red Giant Branch Stars”. The Astrophysical Journal 154 (6): 254. arXiv:1706.05865. Bibcode: 2017AJ....154..254G. doi:10.3847/1538-3881/aa932d. ^ Cuntz, Manfred; Saar, Steven H.; Musielak, Zdzislaw E. (2000). “On Stellar Activity Enhancement Due to Interactions with Extrasolar Giant Planets”. The Astrophysical Journal 533 (2): L151–L154. Bibcode: 2000ApJ...533L.151C. doi:10.1086/312609. ISSN 0004637X. ^ a b c d e Route, Matthew (February 10, 2019). “The Rise of ROME. I. A Multiwavelength Analysis of the Star-Planet Interaction in the HD 189733 System”. The Astrophysical Journal 872 (1): 79. arXiv:1901.02048. Bibcode: 2019ApJ...872...79R. doi:10.3847/1538-4357/aafc25. ^ Shkolnik, Evgenya; Bohlender, David A.; Walker, Gordon A. H.; Collier Cameron, Andrew (2008). “The On/Off Nature of Star‐Planet Interactions”. The Astrophysical Journal 676 (1): 628–638. arXiv:0712.0004. Bibcode: 2008ApJ...676..628S. doi:10.1086/527351. ISSN 0004-637X. ^ Pillitteri, I.; Wolk, S. J.; Cohen, O.; Kashyap, V.; Knutson, H.; Lisse, C. M.; Henry, G. W. (2010). “XMM-NEWTONOBSERVATIONS OF HD 189733 DURING PLANETARY TRANSITS”. The Astrophysical Journal 722 (2): 1216–1225. arXiv:1008.3566. Bibcode: 2010ApJ...722.1216P. doi:10.1088/0004-637X/722/2/1216. ISSN 0004-637X. ^ Pillitteri, I.; Günther, H. M.; Wolk, S. J.; Kashyap, V. L.; Cohen, O. (2011). “X-RAY ACTIVITY PHASED WITH PLANET MOTION IN HD 189733?”. The Astrophysical Journal 741 (1): L18. arXiv:1109.6892. Bibcode: 2011ApJ...741L..18P. doi:10.1088/2041-8205/741/1/L18. ISSN 2041-8205. Seager, Sara (2010). Exoplanet Atmospheres. Prinston University Press. ISBN 978-0-691-14645-4.